Steve's coaching philosophy is based on keeping every aspect of training and racing as simple as possible. With many moving parts to triathlon, having a coach that keeps you from being overwhelmed is essential. Steve's forte is addressing mechanical and psychological road blocks that limit the athlete's potential. Steve coaches 10-15 sessions per week. Through the athlete's feedback and fitness evaluations, Steve develops a sound plan that addresses the athletes's strengths and weakness. 2016 marks Steve's 10th year coaching endurance athletes. Steve's background in coaching started with track & field and cross country. During those first 5 years, Steve's athletes earned 5 WIAA Individual State Championships, 1 State Record, 14 State Medals (all in the top 3), and 24 State Qualifiers. In triathlon, Steve is one of the select coaches currently in the USAT High Performance Mentorship Program. Steve has a strong resume coaching ITU draft legal and age group athletes. His athletes have won ITU Age Group World Championships, 4 USAT National Championships and 4 USAT National Championship 2nd place finishes. Over the 70.3 distance Steve has helped qualify 10 athletes to 70.3 World Championships. 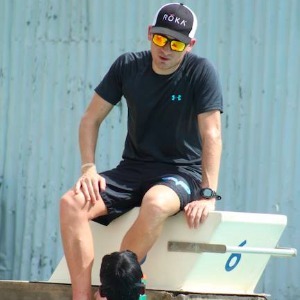 Steve has been named USAT National Coach at 3 different international events including the 2015 ITU Pan American Championships, as well as being selected by USAT to host a Select Camp for the Trinidad and Tobago Federation for their developing athletes. Steve has also worked for the two largest coaching companies in the US, Carmichael Training Systems and Life Time Fitness. In these positions; Steve presented weekly lectures to developing triathlon coaches and instructed at cycling/triathlon camps. Steve spent countless hours in the A2 Wind Tunnel working with athletes on optimizing their bike fit and equipment choices. As an athlete, Steve is an 8x Ironman Finisher and has qualified for the Ironman World Championship, Boston Marathon, and 70.3 World Championships. Athlete's with an open mind and willingness to work hard! Success. Coach Steven Brandes has been notified of your message.